No, it’s not me. I finished those almost a year ago. 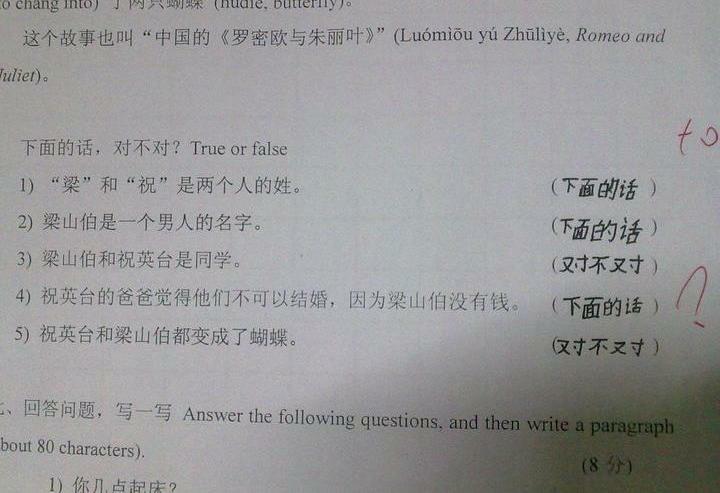 This time it’s a poor fellow who will probably fail his Chinese test. Have a look below. At first I did a double take, ‘cause I wasn’t exactly sure why he wrote 下面的话 and 对不对. But look at the question! Hilarious! Poor guy. However, I wouldn't go so far as to completely fail him on that question. I mean, his assumption wasn't that far off and is actually a clever parallel translation inference.